1. How Long Have You Been Doing Auto Body Repair? One of the first questions to ask when speaking to your prospective auto body repair shop is how much experience do they have. In most cases, shops with more experience on their side will provide better results. At a minimum, the shop you do business with should have about 2 years of auto body repair experience. Anything less than this amount of experience could be considered risky. Another important question to ask your prospective auto body shop is if it is properly insured. If you visit a shop that is not properly insured, and that shop causes damage to your vehicle, you may have no recourse in terms of getting remediation. Auto shops are required to have a variety of insurances, but the most important insurance from a consumer’s point of view is general liability insurance. It’s wise to make sure that your prospective auto body repair shop has this insurance before authorizing any services. When searching for a reputable auto body repair shop, it’s also wise to keep an eye out for proper certification. The highest level of certification in the auto body repair sector is the I-Car Gold Class Certification. Technicians who possess this certification will have passed rigorous tests and training courses which validate their abilities. 4. Can You Provide Any Referrals? It’s no secret that good businesses typically have good reputations, and bad businesses typically have bad reputations. Today, it’s becoming increasingly difficult for a business to cover up poor customer service and shoddy work. If a business can’t get the job done, past customers will let others know through their online reviews. This is why we recommend asking your prospective auto body shop for referrals. Any reputable shop will be able to provide you with plenty of recommendations from past customers. If a shop cannot provide you with referrals, you might want to look elsewhere. 5. Do You Offer Any Warranties? When you bring your vehicle to an auto body shop, you expect the work to be done correctly. If work is not done correctly, you shouldn’t have to pay for it. This is why warranties and guarantees are important. Most auto body repair shops will offer warranties and guarantees on their work, ensuring that you receive the services you paid for. We recommend avoiding any auto body shop that doesn’t provide warranties and guarantees. Though most auto body shops will charge comparable rates for comparable projects, you can never be entirely sure of what a shop will charge unless your actually ask. In order to avoid getting stuck with an astronomically high bill, it’s wise to ask for a written estimate before any work is performed. 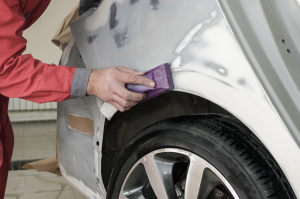 Looking for a Reputable Auto Body Repair Shop in Elmhurst, Illinois? Has your car suffered damage? Looking for a reputable auto body repair shop in Elmhurst, Illinois? Lombard Body & Fender is the shop you seek. Insured, certified, and experienced, we have been serving the Elmhurst area for over 45 years. If you are searching for an auto body repair service, we are the people to see.